Labor Secretary nominee Tom Perez used his private email account to leak information about official business while he was assistant attorney general for the Justice Department’s Civil Rights Division, the House Committee on Oversight and Government Reform said in a Wednesday letter to Perez. Oversight Chairman Darrell Issa (R., Calif.) said it appears Perez used his personal email account almost 1,200 times since 2009 to conduct official department business, including communicating with organizations such as Planned Parenthood, the New York Times, and Talking Points Memo. Issa wrote that he received a letter from the Justice Department’s principal deputy assistant attorney general for Legislative Affairs, Peter J. Kadzik, conceding Perez had committed at least 34 violations of the Federal Records Act. "Contrary to Mr. Kadzik’s assertions, this large volume of personal, non-official emails indicates that you did not use your personal, non-official email account in ‘limited circumstances’ to perform your official duties," Issa wrote. "Instead, it appears that your use of your personal, non-official e-mail account to conduct official department business has been frequent and routine." Issa, joined by House Judiciary Committee Chairman Bob Goodlatte (R., Va.) and Senate Judiciary Committee ranking member Chuck Grassley (R., Iowa), subpoenaed Perez’s personal emails in late March after learning he had used his personal account. Perez has yet to fully comply with the subpoena, Issa wrote. Oversight officials were only given the opportunity to review 34 emails from Perez’ personal account. "You have a personal responsibility to comply with the Committee’s subpoena," Issa wrote in Wednesday’s letter. "To date, you have not personally complied with the committee’s request or the terms of the subpoena. In addition, you have not personally certified the veracity of the statements made by the department in this matter and you have not certified that the department’s assertion about the volume of responsive communications is accurate and complete." The Justice Department did not immediately respond to requests for comment. 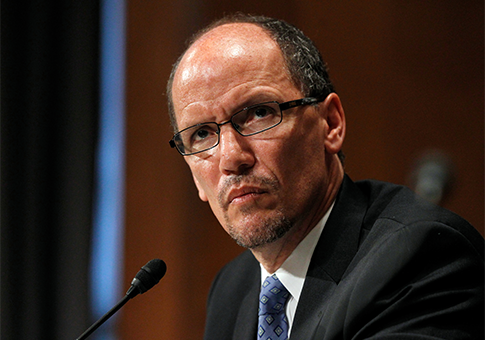 Perez is the latest in a string of Obama administration officials to have been caught using private email for officials business. EPA Region 8 administrator James Martin resigned in February while under a congressional probe for allegedly using a private email account to circumvent disclosure requirements. The EPA’s email practices came under investigation after it was revealed that former EPA administrator Lisa Jackson used a secret email address to conduct business. Jackson and the EPA claimed her secondary address was a common practice among administrators, whose inboxes are flooded with millions of emails per year. However, watchdog groups said it was against the spirit of government transparency and possible violation of the Federal Records Act. Competitive Enterprise Institute senior fellow Chris Horner, who first discovered the existence of Jackson’s secret account, said the Perez emails were another example of "the often pedestrian, occasionally elaborate but all unlawful lengths to which this crowd is going to hide what they're up." Horner said abuse of private email and record keeping "is government-wide in its scope and epidemic in proportion." This entry was posted in Politics and tagged Bob Goodlatte, Chuck Grassley, Congress, Darrell Issa, Department of Labor, EPA, Federal Bureaucracy, House Oversight and Government Reform Committee, Obama Administration, Tom Perez. Bookmark the permalink.